For the first time i tried it for my kids at home. 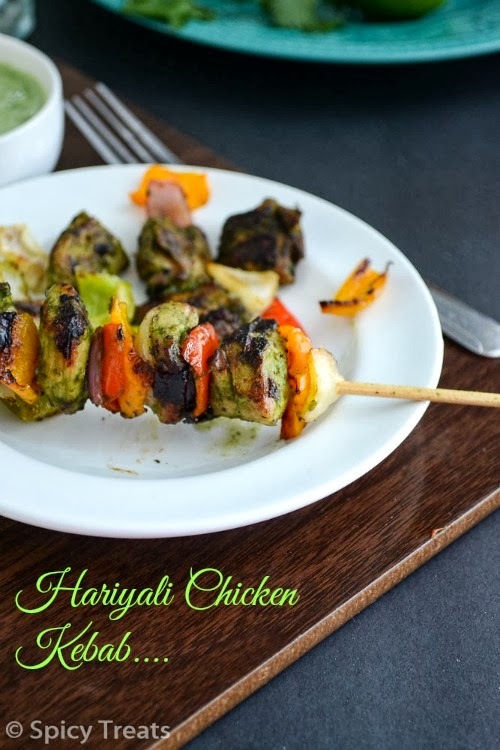 After a long search, finally i was impressed with this Easy & Simple Hariyali Chicken Kebab at Sashi's Recipes. 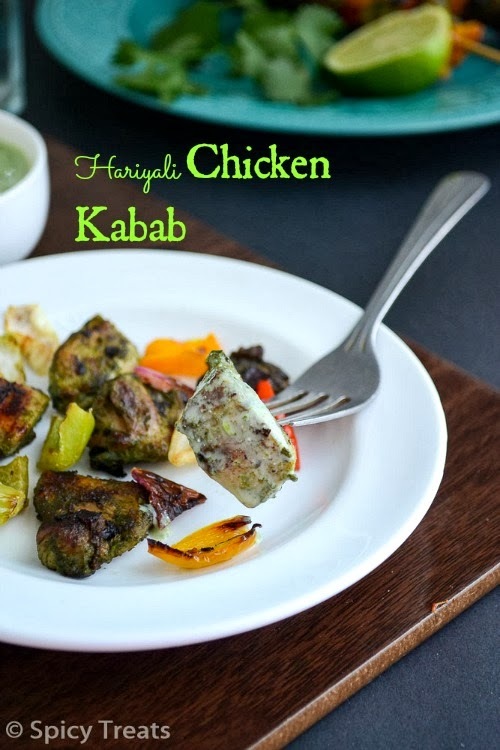 In Hindi Hariyali means Greenery/Green, Hariyali Chicken Kebab means chicken kebab with Greens Paste. I Have already shared the Hariyali Dal recipe before. To make it even more healthy and tasty I added some spinach puree to the Green Pastewhich is not mentioned in the original recipe. Also, i tried grilling method using my panini grill and was bit tensed how my kabab going to turn out. Whether it will get cooked completely or not? Will it have some raw masala smell andmany questions were in mind. Since I had a similar bitter experience with chicken tandoori in one of my friend's place. So to be on safer side i cut the chicken into very small pieces and also used tried with small quantity chicken 200-250 gm of chicken. 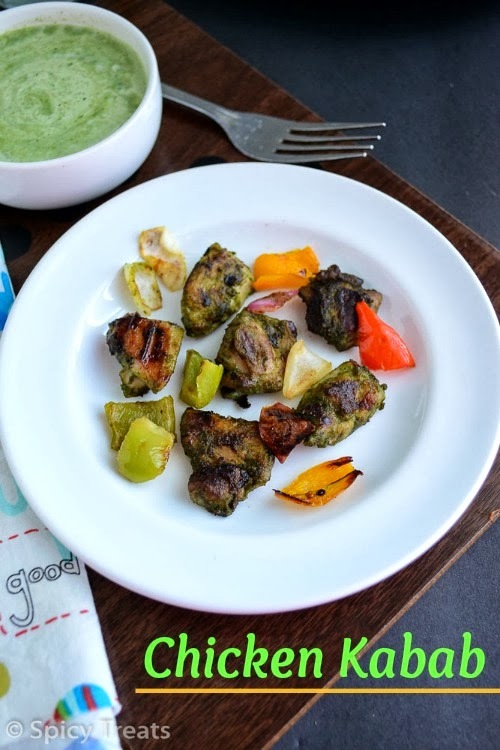 I must say that this Hariyali Chicken Kabab turned out awesome, so soft&juicy chicken kababs with lovely flavors of greens, capsicum,onions And it paired very well with the Mint Yogurt Chutney. 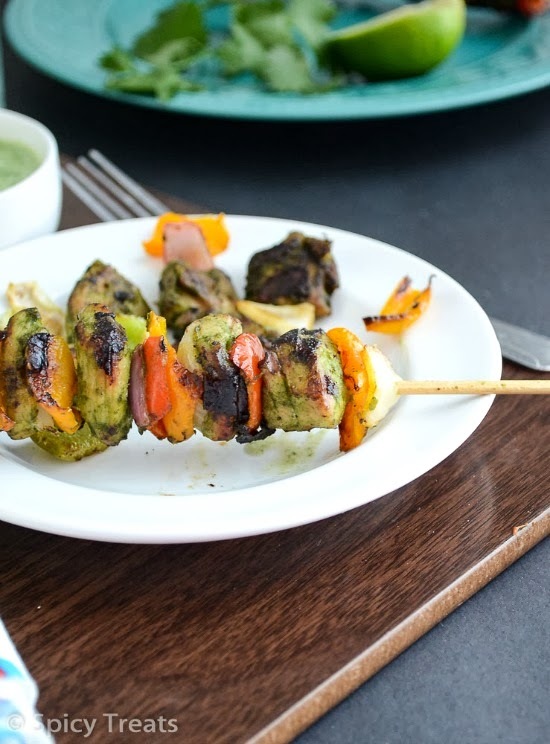 A must try for all the chicken kabab lovers and do not miss the minty yogurt dip. Now off to the recipe..
Clean and Cut the chicken into small or medium chunks. Drain excess moisutre and keep ready. Take the chopped spinach in a microwave safe bowl,sprinkle little water and cook in microwave high for 2 minutes. After that cool for a while then grind it along with other Ingredients inthe heading "To Grind" to a smooth paste without using water. Then marinated the chicken pieces with the ground green paste, yogurt, salt and lemon juice for 3-4 hours or overnight in refrigerator. And then cut onion, capsicum and mix it with salt, lemon juice, chilli powder and keep aside. After Marination, Apply some oil coating on the skewer and arrange the chicken, onion and bell pepper alternatively. Spray some oil on top of the arranged chicken. If you have grill, You can grill them till chicken get cooked and coated with light brown spots. You can do this in Oven also, Preheat Oven to 375 F.
Keep the chicken in the middle layer and cook for about 25-30 min. Turn the skewer stick in the middle for even dryness on the chicken. If you are using the regular oven pans, remove the water collected in the middle of the cooking. by pressing the top plates for few seconds. Then turned the skewer and cooked for another 12-15 minutes or until done. That's it...Spicy & Juicy Hariyali Chicken Kebab ready. Serve hot with Mint Yogurt Chutney. Blend all the ingredients "For Green paste with couple of tbsp of water and keep aside. Now take a wide bowl, add the beaten curd/yogurt mix it with cumin, chaat masala and salt. Then add the ground green paste and mix well. Adjust salt and spice to taste. I used Boneless Chicken thighs, allow the chicken to marinate for long time, so that the chicken will be juicy and soft with all the spices flavor in it. For Vegetarian version, use Paneer, Tofu or Soya chunks. Use thick curd/yogurt for marination. 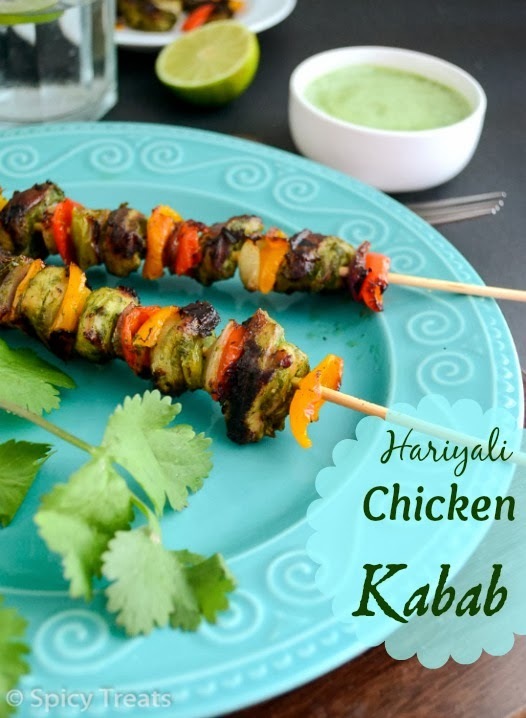 I am a great fan of kababs.........hariyali chicken kababs are truely lipsmacking good. Tryout this version very soon. I always love kebabs. 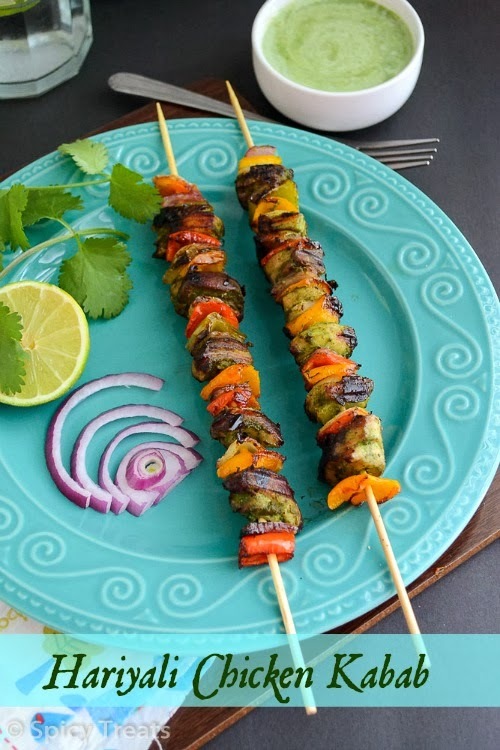 I have tried mint chicken kebabs, they too taste good! Will try this version soon. Simply awesome looking kabab. Wonderful and colorful preparation. This is an awesome recipe. But can you suggest some good tandoor oven.